Photoshop CS6 is arguably the best release of the image manipulation app from Adobe in a very long time. It’s feature packed and generally quite fast, but not everyone is pleased with it’s performance on some hardware. With that in mind we’ve compiled a list of tweaks, adjustments, and tricks to speed up Photoshop. Some of these tips are gathered from a Google Docs file that was sent out on Twitter (hey follow OSXDaily there!) and we’ve added a few comments to those tricks and added some of our own performance recommendations as well. This list was aimed at Mac OS X but there’s no reason the tweaks wouldn’t benefit a Windows PC too if that’s what you’re stuck with at work. 1) Watch the Efficiency Indicator – At the bottom of any open PS window you’ll see an “Efficiency” gauge, if this falls below 100% that means you are using the scratch disk (hard drive) for memory and Photoshop will become slower. Solve this by allocating more RAM or by having less open windows. 2) Close Unused Document Windows – If you’re not actively using an image file, close it. Each open file can take up a significant amount of memory, which can quickly lead to slow downs. 3) Reduce an Images Resolution – Working with higher resolution images and files uses more resources. If you’re going to be saving a relatively low quality version of an image anyway, reduce the image resolution to a tolerable level to gain a nice speed boost. 4) Purge History & Clipboard – Edit > Purge > All. The history feature of photoshop is useful but it takes up a lot of memory. If you’re not using it, purging the contents of history and clipboard frees up resources. 8 ) Set Cache Levels to 1 – Preferences > Performance > History & Cache > Cache Levels > 1, note this can effect plugin and effect quality so use with caution. The default is 4 for a reason. 9) Adjust Photoshops Memory Use – Preferences > Performance > Memory Usage, the Google Doc file referenced above suggested 40% which sounds remarkably low but try it out. In my experience, a higher percentage here is better, and the more memory PS has the merrier it runs. Instead of going with an arbitrary value it’s best to adjust this based on your physical memory capacity and individual needs. 12) Use less Video RAM for 3D stuff – Preferences > 3D > Available VRAM for 3D > 30%, this is particularly useful for anyone using a computer with a video card that shares VRAM with primary RAM, such as some MacBook, MacBook Air, and Mac Mini models. 13) Run Photoshop in fullscreen mode – To get into fullscreen mode, hit the “F” key on your keyboard three times, then hit “TAB” to bring up the interface. This apparently makes panning faster, though I didn’t notice any changes. 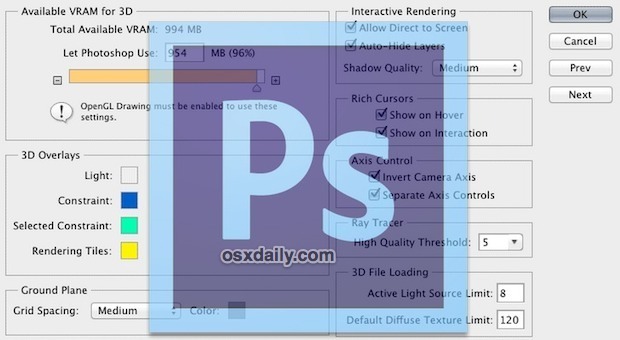 14) Change Photoshop CS6 Appearance – OK so this isn’t an application performance tip, but adjusting the CS6 appearance theme can have an effect on your personal productivity the same way that changing surrounding lighting and wallpaper can impact productivity. Choose a shade of grey that fits you by hitting Shift+Function+F1 or Shift+Function+F2 to darken and lighten the UI, or even adjust color scheme depending on the time of day. While the tips above are Photoshop related, don’t forget to focus on the OS as well. Things like closing unused apps and moving files off the desktop can make a big difference in performance because less resources are being used on other unrelated tasks. You can find a series of simple tips to speed up Macs here, and you’ll find they also speed up Photoshop for machines with limited hardware. Haven’t tried out CS6 yet? The recent beta has expired but anyone can download a free 30 day trial of CS6 directly from Adobe. You forgot “Install an SSD” because that one thing will make PS6 fly! 3 things: 8GB RAM minimum, use a secondary SSD as a scratch disk, have a dedicated GPU. Photoshop screams in that environment. I use only solution no. 8 & its worked !!! my CS6 is now working good not slowly now. Thank you. My system is intell i3 with only 4gb ram and is working good now. I wish. Most of the advanced Designers are stuck with the Adobe Crap until Pixelmator teams adds all the features which we need. CS 6 uses 70 % of the memory that is why its slow CS 5.5 is the best one. I whet from CS 6 back to CS 5.5 because of this issue. CS 6 uses 70% of the memory that is why its slow CS 5.5 is the best one. I went from CS 6 back to CS 5.5 because of this issue. Going to see if Snow Leopard makes a difference at end of month or possibly shell out for a SSD? Crucial are doing some good deals at moment – 512GB SSD for £320?! Hey Susan I think I had the same issue as you, and I dumped the CS6 photoshop preference file which solved the problem! Even after the latest update from Adobe CS6 still hangs periodically and feels sluggish compared to CS5. The tips above helped a little but I think there’s something under the hood that Adobe needs to address. Hi. Thanks for the tips. For me, 200+ layer website design PSDs were taking about two minutes to open, where they would open in about 5 seconds in CS4. I turned off all the GPU options, flick panning, antialiased zoom, etc, as I have ever since they they were all added as options, but that didn’t help. What did help was setting the Cache levels to 2 (going down to 1, as suggested above wasn’t necessary). In fact, I set the History and Cache to ‘Tall and Thin’. Great tip, thanks. My big, multi-layer PSDs open super quick again. Okay so I haven’t run in any slow problems with CS6 it’s fast for me, But the only issue is when I go to render->Lighting Effects,it takes FOREVER to load. It’s like it just freezes up, although I can still see my circular loading bar moving around. If I click anything else that deals with effects like a lens flare it loads perfectly fine and I can play around with the effect. I just want to know why that one option doesn’t load for me. I have a weird problem in CS6 … When i boot it, it works just fine. Quick and responsive. Then, after a while, there starts to be a second delay to everything i do and this keeps building up. Then i quit PS, boot it up again, open the same document(s) and it works fine again. i have same problem with Cs5. Anyone know the solution? Sad to see there’s no useful response for us. To make this problem even weirder: this problem comes and goes too. For a few months it worked perfectly. And now suddenly, i have the same problem again. Did you find a solution, Jigar? Reset Default Settings- If you are using a shared machine for your Photoshop needs there is a little Photoshop start-up trick that may come in handy. When the application is launching, if you press and hold: Alt + Control + Shift (Windows) or Command + Option + Shift (Mac), a window will pop up asking you if you want to delete the Photoshop settings file, resetting all of the preferences to their default. I don’t usually say thank you on posts but some tips are really new to me, so thanks! I was thinking of going back to CS5 before reading this!